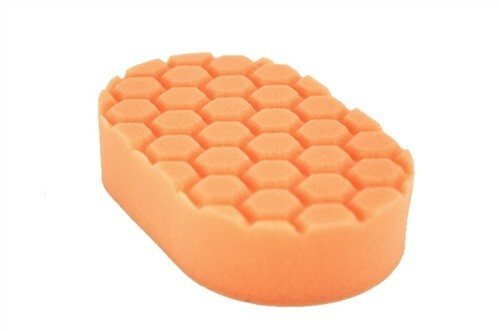 The Orange Medium Cutting Hand Pad is a firm, high density foam pad that is ideal for scratch and defect removal. This pad is perfect for removing swirl marks, scratches, oxidation and marring on any area of the vehicle. The orange hand pad offers the correction of a typical compounding pad while at the same time allowing the polishing ability of a light cut foam pad. When used with heavier compounds it will remove moderate swirls and scratches with little or no haze. It’s an all around pad that will work on most light to moderate imperfections. The high tech foam fits great in all the hard-to-reach places like doorjambs, door handles and engine bays. The cutting power of the orange cutting foam is the perfect solution to restoring headlight lenses after color sanding to restore the clarity. The Hex-Logic Orange Medium Cutting Hand Pad works perfect with any compound or cutting polish to remove oxidation, swirls, and scratches restoring a bright finish. This orange cutting pad works great with V32, V34, and V36 Optical Grade Polishes as well as Scratch & Swirl B-Gone. The Hex-Logic Orange Medium Cutting Hand Pad is a versatile pad that makes restoring damaged paintwork faster and easier than ever imagined. Finally anyone can polish and restore their paintwork by hand using advanced functional surface technology to achieve the highest quality results.